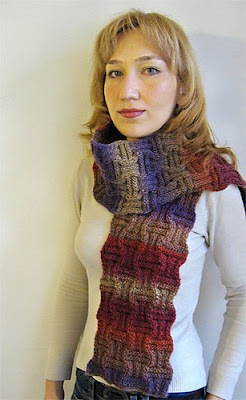 I am very pleased to offer another knitting pattern: a lovely scarf which has a beautiful texture. I thought Poems from Wisdom Yarns, a self striping yarn, similar to Noro (actually a much less expensive substitute) would be just perfect for this project. I used 4 skeins color #585 of this yarn. This yarn is a true pleasure to work with, it is very soft and the colors are my favorites: pastel tones. The link for the free download is here. I would like to hear your opinion and I would be happy to help you with any questions you might have regarding this pattern. Please drop me a line if you're thinking to knit this project. Thanks for the info. Very well written and easy to follow. I have posted a few of my articles on Wacanai.com(http://www.wacanai.com/intro). It's nice because I just link it to my page and when someone searches for anything similar to my article then they recommend mine. They also have some graphs that you can put on your page to help track who's reading your stuff and how helpful they are finding it. Thank you for making and charing this lovley pattern. I´m halfway of mine. 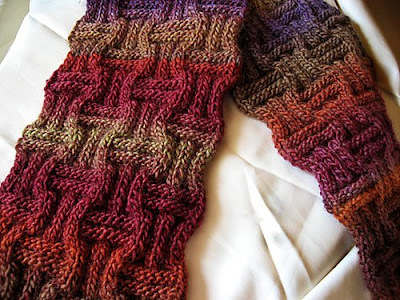 Adore your scarf pattern. Went out and bought Noro same day and am starting it now even tho it's May and i won't be wearing it until the Fall. Added your blog site to my craft blog. Beautiful work! Some new pictures on my blog and on Ravelry. Looking EVERYWHERE for the perfect pattern for my DD. I think she will adore this with the yarn she chose! Thanks! That is really nice, I love the texture.